As I mentioned previously, I spent the first trimester of this pregnancy watching countless episodes of the Duggar family's television show. I had horrible morning sickness and I valued the Duggar family perspective on having children which helped me keep focused on the fact that the condition I was in was a blessed one. At the time, I wrote down a list of reasons why I liked Michelle Duggar and kept it to myself to remember. I figured I would share them with you now as I prepare to share my thoughts on their book, The Duggars: 20 and Counting! . Of course, when you are pregnant, you find it easy to commiserate and spend time with other pregnant women. However, at the beginning stages of pregnancy when you can't leave the house for fear that something bad and embarrassing might happen, you are left at home with Youtube. And so you find other ways to interact with pregnant women. What better pregnant woman to "interact" with than Michelle Duggar of 19 Kids and Counting? She does get tense if there is a deadline that needs to be met and things aren't coming together. In other words: she's human. She feels stress. She never raises her voice to her kids. She suffers morning sickness until the 11-13 week mark. This makes me like her and find her easy to relate to at the moment. 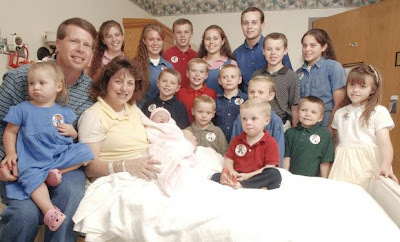 All of their friends who are interviewed about the family share that the Duggars are the most friendly, welcoming hosts. They seem like it. They apparently throw parties and gatherings for their friends because one friend remarked, "Michelle throws the best parties! No one ever wants to miss one of her parties!" So if the woman with 19 kids throws "the best parties" then what's wrong with the rest of us? I love it that they make a point to practice hospitality - to people with 18 kids themselves (i.e., their friends the Bates) as well as to others in their community. Michelle and Jim Bob have well thought-out, reasoned opinions and they present their convictions very well. Because they do such a great job communicating the things that they believe - without a lick of condemnation attached! - even when I don't agree with them, I respect them. Michelle and Jim Bob Duggar love each other very much. And the kids are all aware of this fact and will be quick to tell you so. They accept the fact that people are not used to the idea of seeing so many kids in one family, but they aren't apologetic for it either. And I don't think they have to be. Clearly, what they are doing is working and it's a blessing to see them together. Michelle and Jim Bob say that they are agreeable to doing this show to "encourage others." That phrase might not make sense to the world, but it sure makes sense to me! I would have to say that they've succeeded in encouraging this pregnant mommy-on-the-couch with the little ones who just want to play, play, play!!!! We won't be having 19 children. I can tell you that right now!! (If for some unknown and very hard to understand reason we do - I vow to you that I will not have birthed them all.) But it's encouraging to hear and see such a positive outlook on parenting from a husband and wife who have had plenty of experience and truly love their family. It's fun to see all of the kids interacting with one another and working as a team to get things done. The Duggar family show is really all about faith and family and the two are not separated from one another. I think it's really a beautiful testimony and, yes, an encouragement. I feel I'd like to know them. In the meantime, it's a very calm and relaxing show to watch and I'm enjoying it. I also think that watching their show is wonderfully encouraging. Viewing her patience and true enjoyment of motherhood is inspiring. I see how their children interact with each other and respect their parents, and I want my family to be just like that (with fewer children, of course). I will say, however, that at my house, the girl is the harder of the two and always has been! I'm still wondering over the never raises her voice part. Wow! I have a long way to go! I like the Duggats, too, though. I especially like that they give their critics no fodder. I think you'll enjoy the book. In fact, your talking about it is making me want to pull it off the shelf and read it again (but I have this MOUNTAIN of books I want--or need--to read and I'm actually getting a little overwhelmed by it!)!! I also like many of the things you like about Michelle. I think the biggest reason I like her is her humility. She seriously seems to be one of the most humble people I have seen. She doesn't think (or at least ACT like) she's better than others for having many children and she doesn't seem to have her identity wrapped up in being a mother of many--rather, she's a child of God, a wife, and a mother. I have implemented many of her ideas, including quiet time on a blanket (wonderful and absolutely effective!) and teaching Scripture to young ones with a sing-songy rhythm. She seems to be marvelously patient with her children--a virtue which I am sadly lacking!! Enjoy this fun read and I look forward to your review! I give them a lot of credit because I couldn't do it. I like watching their shows occasionally. They are interesting. I don't know how she just it. I just had my fourth and I spend most days muddled. Maybe I should invest in this book, however, I don't have much time to read these days. Your comment about not leaving the house in the first trimester reminded me about one of the best "diversity" stories from HP. One of my friends was in her first trimester and working for a manager who'd grown up in the Middle East. She was at his desk for a one-on-one meeting about her work when she suddenly grabbed his trashcan, started throwing up and ran to the bathroom. When she came back, he expressed concern and she said, "I wasn't planning to tell you I'm pregnant yet. But since this happened, I'll tell you I am so you know I'm not contagious. And I'm sick everyday." He was very gracious about it but we joked about how he probably never expected THAT in his job, growing up in the Middle East. As usual, you make me want to read the book. She does yell? Really? sigh. I wish I could say the same thing. As one who gets stares at Walmart herself ("Those aren't all your children!" "No, you're right, there are three more at home.") I have huge admiration for a woman who never raises her voice. I've got better about it, but it still happens. I assumed her kids must be little robots, but the first episode I ever saw it was bedtime, and the littler boys were all bouncing on their beds while their older sisters tried to chase them down. Hey, look, my house! I was hooked from there on. Michelle apparently had to really work at not raising her voice. It didn't come naturally to her, you'll be happy to know. ;) But she committed to it and practiced it. Now it's a whole 'nother set of "third trimester" issues when the body is saying, "Enough already!" and there are still little children around full of energy who want to play! Oy - and you can't breath, and you have no balance, and you have to pee every two minutes...understand!